THEY were the three months that Andalucia will never forget. An area that boasts an average of 300 sunshine-filled days a year was confronted with downpours of seemingly biblical proportions. The rain just didn’t stop as it flooded homes, roads and livelihoods. And all records were washed away as the period from December to February was officially recognised as the wettest ever with four years’ of rainfall reportedly falling in just two months. Although the worst rainfall has now passed, for many flood victims the biggest challenge has just begun – how to get compensation for the damage. Despite many parts of Andalucia declared disaster zones – and both the regional and central governments officially setting millions aside to help – it has emerged that insurance companies have gone to unprecedented lengths to thwart reparation claims. In one case, the Olive Press has spoken to one flood victim who claims he is not covered because his home is more than ten years old. Stephen Myhill, 64, from Estepona, revealed that his company, BanSabadell Seguros Generales, are using a ‘defect in construction’ clause in his policy to avoid paying compensation for a deluge of water that left a hole in his roof. But this, of course, did not stop the insurance company taking its annual premiums when he bought the house, which was always listed as being 21 years old. The father-of-five explains: “They told my key holder that because all buildings more than a decade old were so badly built, they are not entitled to compensation. “What’s the point in insuring your house in the first place if the company turns around and says this? Myhill took out a 230-euro a year policy through Banco Sabadell Atlantico when he moved into his Estepona property seven years ago. When contacted by the Olive Press, a spokesperson for BanSabadell Seguros Generales bizarrely denied that the one-line email was ever sent. The spokesperson also explained that Myhill was not entitled to compensation because of his “poorly-maintained” terrace, which allowed water to leak through. However, Myhill insists that the accusation is “nonsense” and that the terrace was, in fact, “practically brand new”. As the debacle continues Myhill is left staring up at a “four-foot squared hole” in the ceiling which needs repairing. The Olive Press has meanwhile been inundated with similar victims, including one expatriate couple who have also been blamed by their insurance company for the 2000-euro damage their roof has incurred. Retired Patrick and Angie Copp, from Jimena de la Frontera, were told by Groupama that they are not entitled to a centimo of compensation as the roof was “poorly maintained” in the first place. “It really is humiliating as we have always taken so much pride in our home, it was kept in pristine condition,” says Angie, 66. The irony of the company’s hard-line stance, even though the town had its annual rainfall in less than two months, is not lost on the former baker. Angie, from North Devon, continues: “It’s not like it has been a normal rainfall, the whole area has been declared a disaster zone. 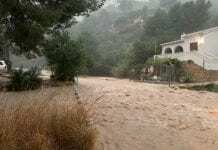 Furthermore, according to national statistics, the Campo de Gibraltar – which includes Jimena – twice received rainfall over the volume usually required by insurance companies for successful claims. Spain’s national meteorological body, the Agencia Estatal de Meteorologia, confirmed that the insurance benchmark of 40 litres per metre squared of rainfall per hour was exceeded on February 15 and 18. And, to make matters worse, just days after the roof was comprehensively damaged, Groupama charged the Copps for their 2010 insurance policy. Another victim has found himself in an equally tricky spot after his insurance company turned him down on the basis that the rainfall in his area did not go above the yardstick rainfall level of 40 litres per metre squared, per hour. Philip Jordan, who lives in Fuentes de Andalucia, in Sevilla province, has tried countless avenues to get the official figures for his area. Despite knowing that the rain was extremely heavy on numerous occasions, his insurers insist the torrents weren’t hard enough. The retired builder, whose house flooded after water leaked through the roof, explains: “If you can’t prove the exact quantity of rainfall that fell during any one hour then they are not interested. A spokesperson for his insurance company insisted that they were completely within their rights to reject the claim and that “this quantity of rain never fell”. She added that people could normally find such data via their town halls or other local weather agencies. Yet Jordan insists that the only local weather information available is that 490 litres per metre squared fell in the area between December 7 and January 8. 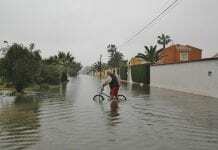 A Malaga weather expert meanwhile, who runs his own meteorological website confirmed the problem faced by flood victims. Harry Happe, of www.meteomalaga.es, explained: “To get a payout in the event of heavy rain you normally need a ‘todo riesgo’, also known as an ‘all risk’ contract. “In many cases the highest rate of rainfall was just 50 litres per metre squared over a twelve-hour period. Meanwhile, another flood victim, who lost his home in the Axarquia to a devastating landslide has remained admirably philosophical despite receiving confirmation he is not covered. Reg Crosby, 66, has been forced to abandon his home close to Lake Vinuela and was told by Mapfre that the ‘act of God’ was not included in his policy. “We were told straight-away that we would not be receiving compensation, but at least the people we have dealt with have been sympathetic. The former financial advisor estimates to have spent a total of 260,000 euros on the home he purchased in 2001. Yet he has not given up hope that there may be some light at the end of a very long, cold and wet tunnel. By our own accounts that is currently set at around 15,000 euros for anyone losing a home, so he might be a little short. Fingers crossed though for all the victims across Andalucia. It will be interesting to see any comments from readers who have had claims met by insurers in 2010, because it seems that a cartel is operating in that they have all agreed that they will refuse all claims on any pretext-‘Act of God’, Not enough Rain (really??! !,property older than 10 years, poor maintenance etc etc. For those with claims declined as ‘Acts of God’ do watch the Billy Connolly movie: ‘The Man who sued God’ Excellent (and funny) movie about the little man taking on the mighty insurer – and winning!! Filmed in Bermagui-a beautiful small resort on the S:E Australia coast. independent website collecting information on claims not settled. I am pleased to say that I did get paid eventually. I ket on nagging them by phone and email and insisted that their perito re-visited, then I got him onside, and got paid.